When I was a kid we had a neighbor who had 7 kids, 5 of them girls – which was awesome because we had 5 girls in my family. We had some really fun times. But there was one thing that I was very jealous about: for their birthdays they would get a doll cake. Those cakes were beautiful and they had a real doll in them! 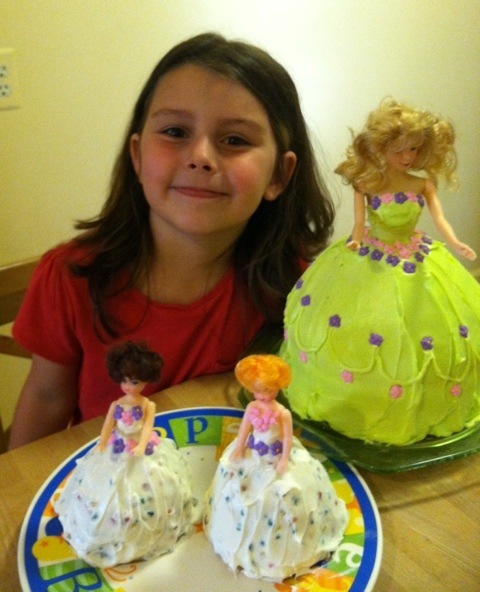 So when I got my daughter I couldn’t wait to for her to have a doll cake – no way was I going to let my baby go through the emotional trauma of never having a doll cake! 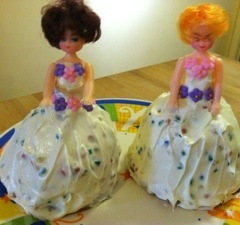 Of course then I had to make sure my nieces had doll cakes because I am a good aunt. And so today I found myself making another doll cake! I actually can whip these cakes out pretty quickly by using a box cake mix, canned frosting, a doll pick and purchased sugar flowers. What I have found is that the kids have never seen a professionally decorated doll cake so my slapped together version is beautiful in their eyes. I let them pick out the flavor of the cake and color for the dress. Then I throw a few drops of food coloring in the frosting and simply spread it on – carefully covering the doll’s “boobies” with frosting! Then I stick on some flowers and I am done. A few years ago I did make the mistake of making a little doll cake for each girl at the party and so I now have to carry on that tradition. But so what! 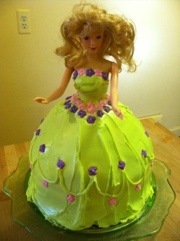 They will quickly outgrow these cakes and my doll cake career will be over. The important thing is that they will never have to suffer the trauma of not having a doll cake!